A local bank may have just inadvertently revealed the local retail prices of two Samsung devices that are yet to be launched here in Malaysia. 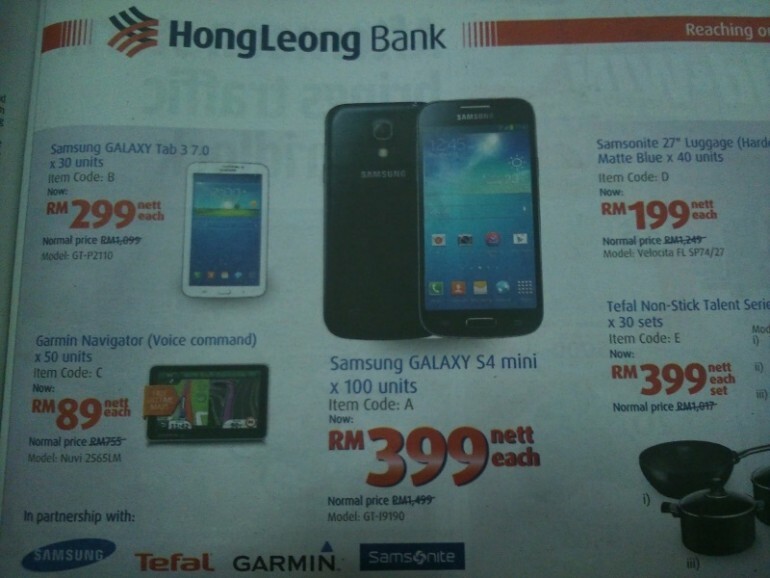 In Hong Leong Bank’s latest credit card rewards promotion – which went live last week on July 1 – the bank is offering, among others, both the Galaxy Tab 3 7.0 and the Galaxy S4 Mini at heavily discounted prices. What an eagle-eyed reader tipped us was that the promotional content also clearly shows the retail prices of both devices, where the Galaxy Tab 3 will retail for RM1099, and the S4 Mini at RM1499. We’ve reached out to Samsung regarding the matter, and will update the post when we receive a reply. The promotion also clearly states that Hong Leong are working “in partnership with” Samsung, so there’s a high chance that this may be the final retail prices for both devices.